So began Mohandas (Mahatma) Gandhi’s speech on 12 March 1930, given before he walked 390 kilometres to the coast town of Dandi in Gujarat. There he made salt from seawater, refusing to pay the salt tax imposed by the colonial British Government and therefore breaking the law.1 This simple act, known as the ‘salt satyagraha’, inspired nationwide civil disobedience and is seen as the beginning of an intensified Indian independence movement. Gandhi’s legacy of non-violent protest continues to influence political action worldwide. In ‘Public Notice 2’ (2007) contemporary Indian artist Jitish Kallat renders Gandhi’s historic speech in its entirety, recreating each of its individual letters as stand-alone pieces. 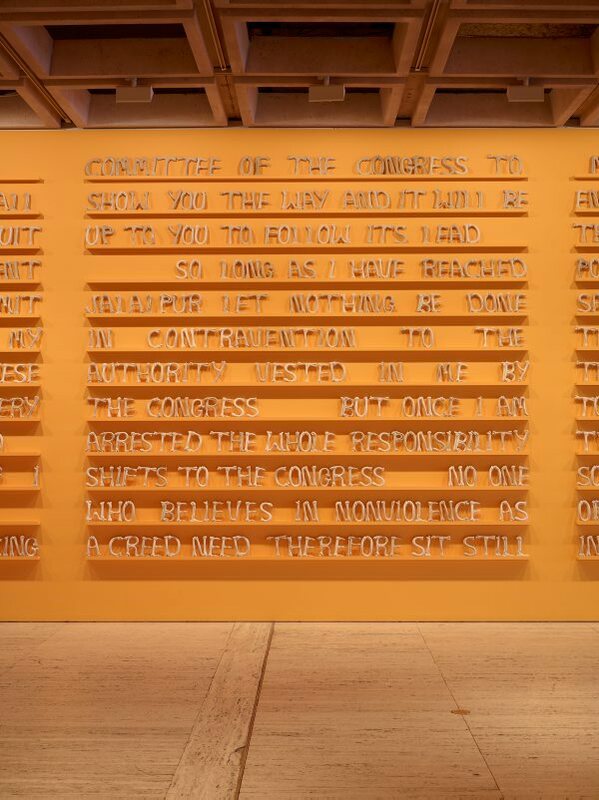 The work spans the entrance court of the Art Gallery of New South Wales, its yellow walls enveloping the space in sensual colour. The letters look like bones, suggesting a display from an archaeological dig, as though Kallat has excavated these words from their historical resting place. In 1947 India gained independence from British rule. At that same moment the country was partitioned into India and Pakistan. The violence of this event still reverberates in these two countries. In 2002 in Gujarat, over 1,000 people were killed in an outbreak of communal violence. 1. A tax imposed on the people of India in 1835 and that reaped major dividends for the traders of the British East India Company and then the administration of the British Commonwealth. 2. Jitish Kallat, artist’s statement, www.saatchigallery.com/ artists/jitish_kallat_resources.htm (accessed 12 December 2014). 4. Shaheen Merali, ‘Delineating the Vernacular’, Art Institute of Chicago Museum Studies, vol. 36, no. 2 (2011): p.46.